Use Two Whatsapp Accounts in One Android Smartphone: Hey, readers! As we all know WhatsApp is the best messaging app source to all. It has nearly reached 800 million users in April 2015 and in September it reached 900 Million users as per Wikipedia. They can interact easily through an android app and the services provided WhatsApp was like amazing. Free messages, Free Calls, can send images, videos, any media and can change their Whatsapp DP, WhatsApp Status as well. Such a great app is now owned by Mark Zuckerberg. So, how about using two Whatsapp accounts in one mobile. Did you imagine anytime? Do you ever wish to use two WhatsApp accounts in one mobile? Yes! right. But, you don’t have any tricks or methods to use 2 WhatsApp accounts in one Android smartphone right. No worries. Because to my knowledge, I found a method which everyone can make use of it to use dual WhatsApp. Today I am back with a trick where you can use two (2) WhatsApp accounts in one Android Smartphone device. Yeah! Now, you can use 2 WhatsApp accounts in one android device without any issues. If you use this trick correctly then you can use dual WhatsApp-like Dual SIM in your mobile. So, at last, this trick is working for me and hope it will for sure to you all. Let’s get deep into the article. Generally, to use two WhatsApp accounts in our android mobile, many people say to root your android smartphone which is not a suitable method for us. But, with this article, you can install dual WhatsApp accounts on your android phone without Rooting your android device. Another positive thing is you can use this method for both Rooted and non-rooted Android smartphones. This method is very well tested and released out now. All you need to do is to follow the steps carefully and read the entire article carefully. Don’t leave the article by reading the first step and doing on your own. Don’t take the risk. No need to worry about using two WhatsApp accounts in single mobile. There are many benefits in using dual WhatsApp. The advantages of having two WhatsApp accounts in one android device are as follows. Before using two WhatsApp accounts, we need to get ready with few things. Ingredients to use dual WhatsApp accounts. So, get ready with all the requirements below. 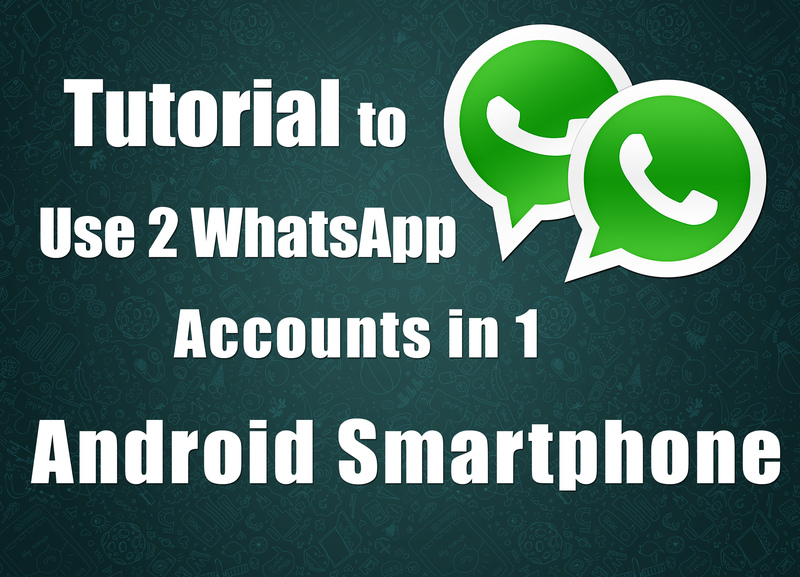 Here, goes the step by step procedure to use two WhatsApp accounts in one android mobile. Follow them carefully and implement them carefully. Firstly you have to download the Whatsapp App here (Updated on 26th September 2015). Then Install the Whatsmapp App in your Android smartphone. After the completion of installation, open the app and enter the mobile number which you want to use as secondary WhatsApp account. After entering your number, for confirmation, you will receive an OTP to the number you have entered and it will automatically verify in some seconds like normal WhatsApp. That’s it. After verification, your mobile is now working with two WhatsApp accounts so called as Dual WhatsApp accounts in one android device/smartphone. The second WhatsApp account is created as Whatsmapp, where you are using with the second number as the new and secondary WhatsApp account. In this way, you can use two WhatsApp accounts in one Android smartphone device without any issues. Hope you all liked this method and it will work for you all for sure. WhatsApp supports only a few operating systems as of now. At present WhatsApp supports these operating system such as iOS, Android, BlackBerry OS, BlackBerry 10, Windows Phone, Nokia Series 40, Symbian and Tizen. Want to make your WhatsApp more special, then this is for you. If you want to make custom fonts in your WhatsApp then it is possible only with this method. You can make any type of custom, animation, designed fonts in WhatsApp. Here you go, Make Custom Texts on Whatsapp with Text Art Android App. You can attract your friends, loved ones with this custom text art app. Everyone must try this app at least once in their lifetime. Recently we have heard about the security in WhatsApp. Though it is a very popular app, it also has some security issues. So, following security tips will never lose anything for us. I have mentioned few security tips to you all. You can follow these security tips to be safe in WhatsApp. Feel free to give some more tips in the comments below. We all know that WhatsApp has added a new feature called “WhatsApp Calling”. To my experience, WhatsApp calling is best as normal voice calls. If you have good internet speed you can make good bandwidth calls. If you haven’t activated WhatsApp Calling feature in your WhatsApp android app till now, then there is a neat tutorial for WhatsApp calling feature. Do it as accordingly and experience all the features in WhatsApp. That’s all !. You are done with the two (dual) WhatsApp accounts in one Android device. If any issues are raised during the installation, let us know in your comments below. If this method is successful for you and using without any issues then comment below. Let us know how many of you are using this method without any issues. If this method is working for you then share with your friends who are in search and let your friends try this method. Thank you all !!! Which method do you prefer to use two WhatsApp accounts in one mobile? Thanks for such a amazing article again. I am going to use this method and hope it would work . Definitely this method will for sure. Once you implemented let us know in your comments about your experience of using 2 whatsapp accounts in 1 android phone. what are the benfits with dual whatsapp.??. Before leaving the page I would like to thank you for your hard working. thanks for sharing information how to use two number in one whats app messengers. is there other special software offering bulk sending in what apps.